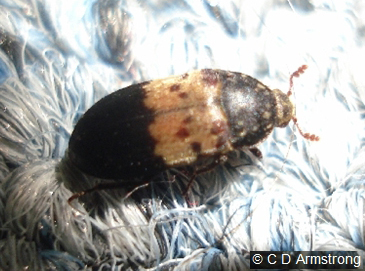 Larder beetles, as their name implies, prefer meat or meat by-products. Mounted animals may also become infested. However, larder beetles can survive on other organic materials too. Infestations in homes most likely come from infested dry dog and cat food or bird feed. It is not unusual to find new infestations where rat or mouse baits have been used. The beetles can infest the baits and also the vermin carcasses. They will also feed on accumulations of dead cluster flies. The adult larder beetle is about 3/8 inch long, black with a lighter stripe across the middle on which there are six small black spots. 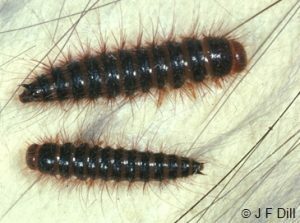 A full grown larva is about 5/8 inch long, somewhat fuzzy, with two distinct spines on top of the back end that curve backward. When mature, the larvae can become even more destructive by chewing shallow holes into wood, in which they pupate. To lessen the chances of larder beetle infestations, store food in glass, plastic or metal containers with tight fitting lids. The first step in controlling larder beetles is looking for the source of infestation. If you find an infested product or item, do not throw it away before destroying the infestation. To kill insects in a package that you intend to throw out, place the package in an oven at 125 to 140°F and heat for 30 minutes to fully penetrate the package. Other means of destroying the pests is to place the package in a freezer at -20°F for a week, or spray with an insecticide. Only then should you discard the infested package. This will keep the pest from spreading. There are several insecticides available to control larder beetles at home. To avoid confusion, it is best to purchase a brand that lists larder beetles or “general household pests”. Some options include resmethrin, cyfluthrin, tetramethrin, and permethrin. These are for crack and crevice treatment only and provide residual protection. There is no need to spray walls, ceilings or floors because the insects usually hide in cracks and crevices, or in food packages. Purchasing an aerosol spray can with a small 5 inch extension tube is handy for getting insecticides into cracks and crevices. Another approach is to apply the pesticide to corners and edges of storage areas with a small paintbrush. A good job of vacuuming removes dust or debris from cracks or crevices, permitting better penetration of insecticides. The vacuum cleaner bag should be put into a plastic bag and sealed before disposal to prevent insects from spreading.